the league outlawed the lens flare stick. Teemu Selanne will be wearing an away jersey tonight in Winnipeg, but he won't be hearing many boos. In fact, Jets fans are likely to give him a hero's welcome. It's been over 15 years since Selanne last played an game in Winnipeg, but fans there haven't forgotten the magic moments he created as a Jet in the early 90s. Once the NHL announced the return of a franchise to Winnipeg, fans circled tonight's game on their calendar for what's sure to be an emotional reunion. So as Winnipeg prepares to give Selanne a long-awaited ovation, let's take a look back at the career of one of hockey's most beloved superstars. 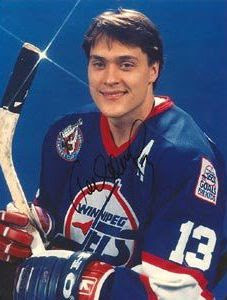 June 11, 1988 - Selanne is drafted with the 10th overall pick by Winnipeg Jets general manager John Ferguson Sr., who must then explain to his confused son why he's not immediately trading him for a terrible backup goalie. October 8, 1992 - Veteran Jets defenceman Randy Carlyle refuses Selanne's request for his jersey number 8, then wonders why the rookie is walking away mumbling something about "payback" and "revenge" and "Bruce Boudreau in 20 years". March 2, 1993 - Selanne breaks Mike Bossy's rookie goal-scoring record and then famously mimes shooting his glove out of the air, while a young Artem Anisimov watching at home imagines how everyone would probably think it was really cool if he did something like that too someday. June 17, 1993 - After finishing the season with 76 goals and 132 points, Selanne wins the Calder Trophy for top rookie in a close vote over the other two finalists, "Ha ha ha" and "No seriously, Teemu Selanne had 76 goals and 132 points this year, why are we even voting on this?" April 4, 1995 - My wife finally realizes that the flashy kid on the Jets who scores all those goals is not in fact named "T. Mussolini" in a moment that I wish I was making up. February 7, 1996 -Selanne is traded to the Anaheim Mighty Ducks, which devastated Winnipeg Jets fans assume will be the worst thing to happen to them all year. January 18, 1998 - Selanne scores a hat trick and is named MVP of the All-Star Game, finally putting to rest the old stereotype that Europeans just don't want to win badly enough when it comes to intolerably dull corporate shill-fests. March 5, 2001 - The Mighty Ducks trade Selanne to San Jose Sharks, but hold open the possibility that he could always return to the franchise in four or five years as a consultant or an assistant scout or a dominant first-line winger. July 3, 2003 - Selanne signs a heavily discounted free agent deal to join the Colorado Avalanche for one season that nobody remembers because it never happened. September 15, 2004 - A slumping and aging Selanne returns to his native Finland to undergo knee surgery during the NHL lockout, since having all your internal organs replaced with titanium cyborg parts is apparently now called "knee surgery" in Finland. June 6, 2007 - Even during his most triumphant moment the classy Selanne insists on sharing the credit with those who made it all possible, which makes it kind of awkward when he goes to hand the Stanley Cup to Chris Phillips. January 28, 2008 - Selanne announces that he will return to the Ducks for one final season, on the condition that everyone agree to act surprised when he makes the exact same announcement every offseason for the rest of his life. February 20, 2010 - An assist in Finland's win over Germany makes Selanne the all-time scoring leader in Olympic hockey, although the record is broken a few days later by every single Canadian player who gets a shift against Evgeni Nabakov. March 28, 2011 - Selanne becomes the oldest player in NHL history to score on a penalty shot, then regales his younger teammates with stories of days long ago when penalty shots were still considered exciting back before Gary Bettman brought in the shootout and ruined them. December 17, 2011 - As the heartfelt pre-game ovation swelling around him grows louder by the moment with no signs of letting up, Teemu Selanne begins to get the vague feeling that he may have been in this city before and should possibly remember who any of these people are. Let us know how Mrs. DGB responds when she sees this (or somebody shows it to her). Not just hockey. I don't remember 2003 at all. But I do have an unreasonable dislike for Tony Granato for some reason. the Ferguson fam. joke was hilarious! And a tad disturbing and downright depressing as all Ferguson-jokes should; be it Sr. and/or Jr. in the crosshair. And the high funny-level was maintained all the way - one of the more laugh-out-LOUD funnier posts in a while! I am laughing so much at all of these that I can not figure out which one is the funniest. Maybe it is the one that causes me to laugh so hard I don't get enough oxygen and faint. Nice job. 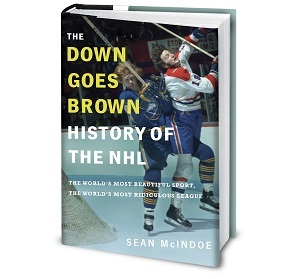 Down Goes Brown gets bookmarked. The caption was amazing. Needs some love. Love the caption. I call him Tay-mu though, Tea-mu just sounds so awkward to me. My mom used to think the Devils goalie was Mark Tanbrodeur. I have a Selanne Colorado Avalanche hockey card. One of my favourites. A non-hockey fan (from Winnipeg) in our house at university seriously called him Shampoo Salami. Holy crap that "T. Mussolini" line cracked me up. I wouldn't be surprised if there was someone in Boston with the last name "O'Chara"
My wife thought the exact same thing. No joke. "...when he goes to hand the Stanley Cup to Chris Phillips." lol. awesome. As long as we're going off topic with mangled names, My all time favorite was Step On My Toe. Wow I thought my sister was the only one with the T. Mussolini thing. LMAO!!! This post is funny as hell and the comments are even funnier!!! When it comes to butchered names, I'm all too familiar. We've been called My-cow-ski; Michael-ski; Me-chow-ski; McLao-ski; Mike Wazowski; and, my favorite, Malarkey. So, as a kid I'd say my surname was Selanne because it was easier for the other kids. Oh, and when I was really little, I thought his first name was Timon, like from The Lion King.